Nast Partners is a Certified Partner of The Predictive Index, the world’s leading Talent Optimization platform. We’ve all experienced the thrill of being part of an amazing team, if only for a fleeting moment. Trust, collaboration, and that unstoppable feeling – it’s magic. So, how do you design a winning team? Is it more about raw talent or chemistry? How do you scale that design across the organization so productivity soars and your culture thrives? Nast Partners is a talent optimization strategy firm. We help businesses determine if their leadership, teams, and culture are well suited and aligned to their business strategy. Diagnose– The insights uncovered by diagnosing the root cause of an organization’s people problems, help to optimize how they design their people strategy, hire purposefully and inspire effectively to drive an engaged workforce that produces results. Design– Businesses can’t just put a random assortment of people together on a team and hope for the best. To achieve the best outcome, an organization must leverage people data to deliberately design its approach to leadership, culture, and team dynamics. Hire– The ability to hire well sets the stage for future organizational success. Defining the roles an organization needs and matching the right person to the requirements boosts the opportunity for success. Inspire– When leaders understand their employees, and employees understand each other, they are equipped to minimize conflict, reduce organizational toxicity, and communicate more effectively, letting distractions get out of the way of results. Talent optimization is driven by people data. When business leaders measure people data and apply the resulting insights, they’re empowered to make objective decisions rather than subjective ones. There are a variety of tools and techniques to collect and measure people data for talent optimization. While it’s true that people are complex, this is no excuse to just accept the status quo. 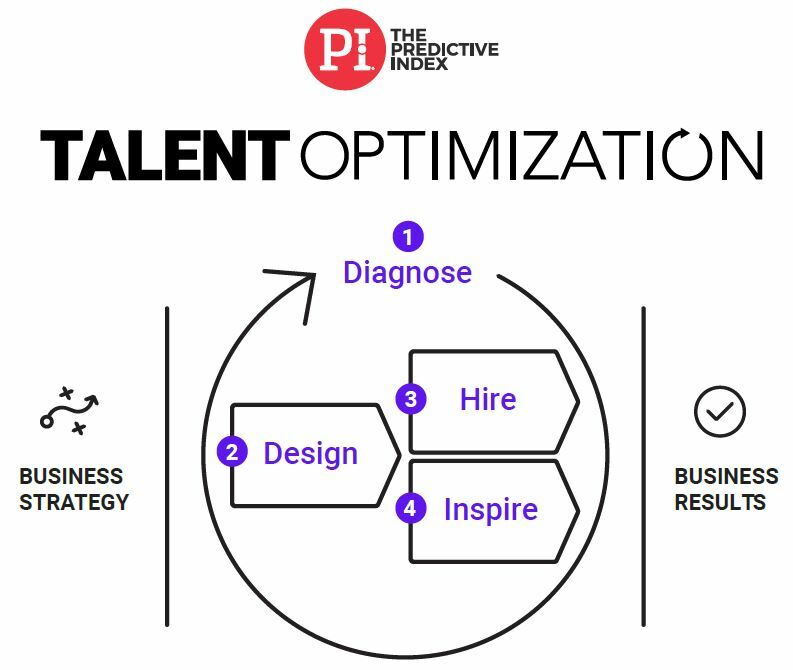 With the right people data in hand, talent optimization reveals that the way people behave and interact in organizations is in fact predictable given the business context. What matters most is to take an objective, systematic approach to understanding people in organizations and using the resulting insights to make improvements to the way they work. Work with executives and department leaders to understand the strategy of the business to ensure they hire the right people and manage, motivate and inspire people and teams to maximum productivity. Measure people data, analyze data within the context of the business, and prescribe solutions. Leverage insights from people data to help the organization hire the right people that map to their strategy. Help leaders use people data to drive important employee-focused initiatives such as career pathing, building and reinforcing the organizational culture, and day-to-day management of people and teams. The Predictive Index helps us come to a conclusion about a candidate in a relatively short amount of time. Unlike a lot of other solutions, PI provides a deep quick read on an individual and allows us to manage the hiring process ourselves.